Military interest in point detection of toxic chemical materials, such as chemical weapons, led to the development of a new, hand portable Gas Chromatography/Ion Mobility Spectrometry (GC/IMS) instrument. This new instrument called the EVM II (Environmental Vapor Monitor) is based upon the combination of a Graseby Dynamics' "CAM" (Chemical Agent Monitor) type IMS device and FemtoScan's "Enviroprobe" Automated Vapor Sampling GC instruments. This powerful combination offers greatly improved interferant rejection and enhanced quantitation capability when compared to "IMS only" instruments and does so without compromising the portability and rapid response characteristics of CAM-based IMS instruments. Many of the compounds of interest to the military are closely related to commercially available (or previously available) chemical pesticides. Therefore, the work reported here explores the use of the EVM II for in-situ vapor detection of various pesticides. In particular, this effort focusses on semi-volatile phosphorous and chlorine containing species which might be suitable for detection in a low power (and therefore low temperature isothermal) portable GC instrument. The current analytical protocol calls for the use of rapid (30-60 s long) GC separations followed by detection and quantification of the various species in the IMS cell. Typical detection limits from previous work were on the order of 10 to 100 ppbv. This speed and sensitivity would allow for rapid screening of large areas for chemical contamination. If similar conditions could be obtained for a set of environmentally relevant pesticide compounds, then this instrument would have a significant new commercial application in addition to the military interest in the product. Previous work [Final report to the Defense Nuclear Agency on contract DNA001-93-C-0214, FemtoScan Corporation, April 1994] has demonstrated that relatively low temperature isothermal separations of semi-volatile phosphorous based chemicals can readily be obtained using a short (5 m) column in a laboratory GC/IMS instrument with simultaneous MS detection. These results have been taken as evidence that suitable methods could be developed using a hand portable GC/IMS for the detection of organic pesticides. Based on this work and an examination of semi-volatile pesticides included in EPA methods, a small group of phosphorous and chlorine containing chemicals were selected for testing. Compounds from this list were used to challenge the EVM II GC/IMS instrument under its maximum temperature operating conditions using a standard thin film column. These challenges were first made as a simple headspace sample to verify detection and retention characteristics. Where possible, known concentration vapor dilutions were used to determine the sensitivity of the method for particular analytes. Demonstrate the capabilities of the EVM II for in-situ detection of a select group of semi-volatile pesticides. Determine the range of volatility of target analytes accessible using a simple (isothermal) analytical protocol. Evaluate instrument sensitivity and selectivity for target analytes using both positive and negative ions. Examine the potential for simultaneous detection and quantitation of the full set of target analytes. Recommend improvements that will extend the capabilities of similar instrumentation to less volatile species and broader boiling point ranges. A collection of 21 semivolatile pesticides was tested on the EVM II instrument. These compounds are listed in the following Analyte Summary Table which contains the analyte concentration information. This effort first involved a headspace challenge from the target analyte using a long AVS sampling time in both positive and negative ion modes to determine if an analyte response would be obtained. At the 100 C maximum GC operating temperature, instrument analyte responses were confirmed for 10 of the test analytes. These test materials contained a number of more volatile analytes, therefore retention time data were used for confirmation based on comparison with vapor pressure and other published GC data. Detected analytes in the preliminary testing were then tested using a vapor pressure dilution apparatus to provide sensitivity data. 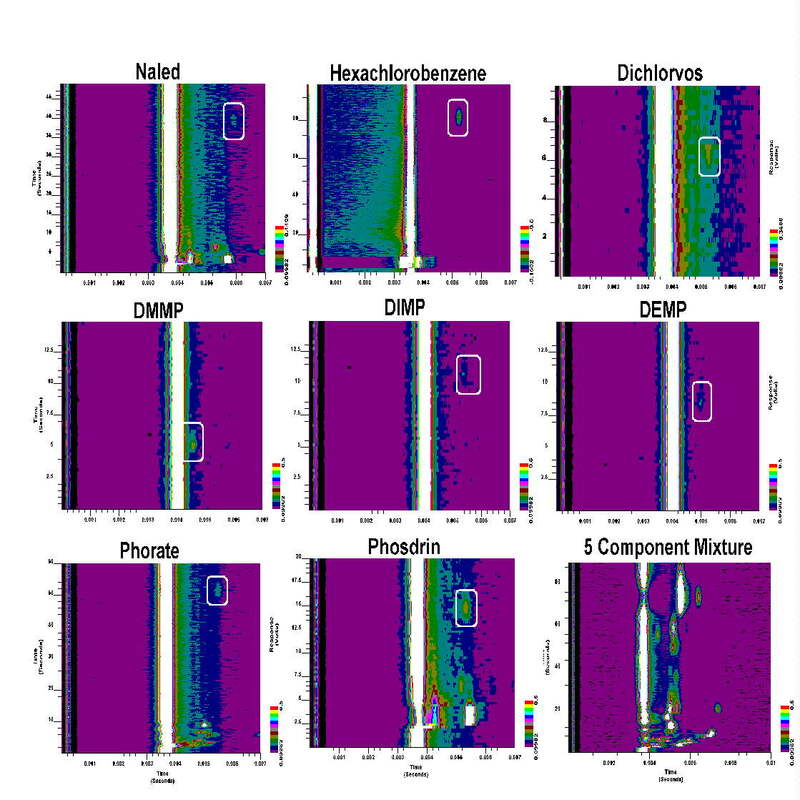 GC/IMS responses for eight of these analytes are presented here as "false color" contour displays. Detection limits at 1 ppbv were obtained for both DMMP and Dichlorvos. Also included in the false color displays is a GC/IMS separation of 5 analytes which includes a number of impurities. This illustrates the effectiveness of this approach when separating complex analyte mixtures. Effective detection of low volatile pesticides can be obtained with a low power, hand portable, hyphenated GC/IMS instrument. The combination of short column GC and a sensitive, chemically specific IMS detector allows even mixtures of analytes and/or analytes in complex background matrices to be detected. A broad range of volatilities may be addressed using this technology. Future advances in low power temperature programming may further extend the volatility range of analytes suitable for determination during a single analysis. While this technique has shown the strength of hyphenated systems, it is not suitable for stand-alone detection of unknown analytes. Even for the case of known analytes shown here, trace amounts of volatile impurities may give the impression of a positive target analyte response. Modulation of the AVS sampling pulse duration provides an effective means to modify the GC separation characteristics to optimize the sensitivity and specificity of the method for a particular analyte. For suitable analytes, GC/IMS represents an extremely sensitive means to detect and quantitate target analytes over an appropriate dynamic range, even in a field portable setting. The authors wish to credit the sponsorship of the U.S. Army Edgewood Chemical Research and Development Engineering Center (Contract #DAAA15-94-C-0001) and the Defense Nuclear Agency (Contract #DNA001-93-C-0214). These grants were both made under the Dept. Of Defense Small Business Innovative Research Program.